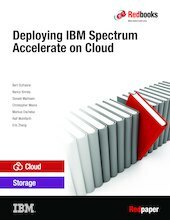 This IBM® Redpaper™ publication provides information about IBM Spectrum Accelerate™ on Cloud. IBM Spectrum Accelerate on Cloud supplies a smart storage solution using servers on SoftLayer® cloud. It enables you to consume storage as a service without the need to install or maintain any hardware or software components. IBM Spectrum Accelerate on Cloud enables users to replicate data in the cloud, as an affordable disaster recovery (DR) solution. The primary data can be either on IBM XIV® Storage System devices, or IBM Spectrum Accelerate, on or off premises. The initial deployment on SoftLayer is performed by engaging IBM Lab services. This paper first describes the tasks performed by IBM Lab services, explains the required customer preparation tasks, followed by typical use case scenarios.